The reviews are in! People are raving – as one audience member so appropriately described it as ‘a haunted house with a plot.’ Read the reviews here and here. The Revenants are here. What would you do for the ones you love? 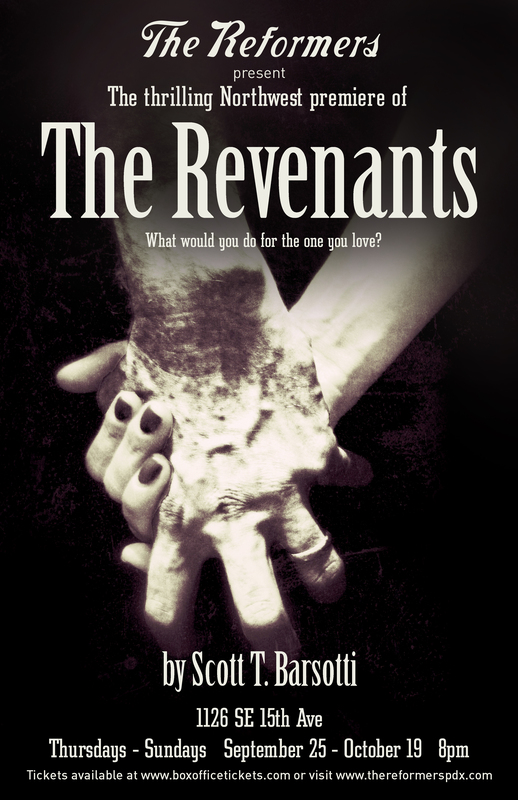 The Reformers are pleased to announce the Pacific Northwest premiere of The Revenants by Scott T. Barsotti. The Revenants tells the story of two couples who hole up in a garage at the beginning of the zombie apocalypse. The play will be performed in an actual garage adding to the realism and terrifying action of the play. Seating will be limited, reservations are highly recommended. It’s the perfect show to put you in the Halloween spirit. The Revenants features Chris Murray*, Christy Bigelow, Jennifer Elkington and Sean Doran. It is directed by Charmian Creagle. Sound design is by Drammy award winner Richard E. Moore. TICKETS ARE $15 AT THE DOOR OR YOU CAN PURCHASE THEM ONLINE HERE. EMAIL US IF YOU HAVE ANY QUESTIONS! We are also running an Indiegogo campaign to help fund the show. Check it out!